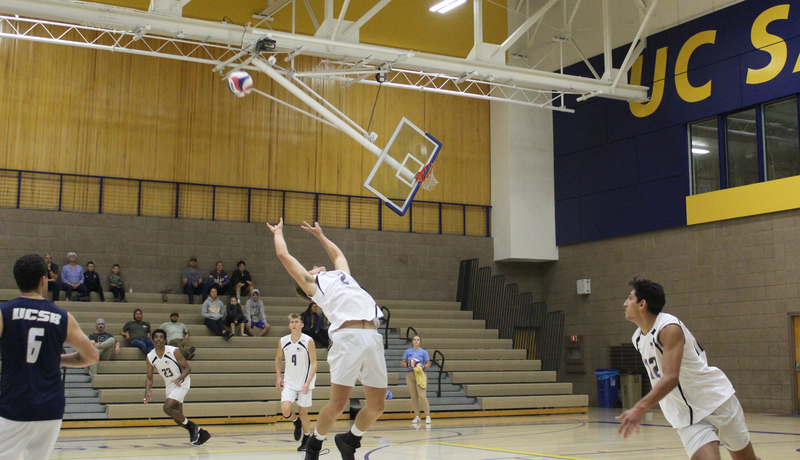 A two-week break in the schedule resulted in considerable rust for the UCSB men’s volleyball team in its return to action on Friday night. Despite their struggles, the third-ranked Gauchos were able to grind out a 25-20. 25-22, 32-30 victory over 12th-ranked Cal State Northridge in a Big West Conference match. Corey Chavers led the way for UCSB with 14 kills, but it took 33 swings as the visiting Matadors locked in on the senior outside hitter. The extra attention on Chavers opened the door for freshman Ryan Wilcox to get 1-on-1 opportunities and he made the most of them. Wilcox finished with 12 kills on 23 swings and came through in clutch moments to secure the sweep. In the first set, a cross-court spike by Wilcox put the Gauchos in front 10-9 and they never looked back after six ties and two lead changes early in the set. A soft tap over the block and down by Chavers clinched set two for UCSB. The third set was hotly contested from the beginning and featured 23 ties and nine lead changes. The Gauchos took a 31-30 lead on a well-placed tap to an open spot on the court by Wilcox. And clinched the match on a Spence Fredrick ace serve. Frederick finished with 11 kills on 30 swings. The Gauchos will finish off the back half of the home and home series at Cal State Northridge on Saturday beginning at 7 p.m.